Could climatologists predict drought the way meteorologists forecast the weather? If one Texas A&M University researcher has his way, the answer is yes. Through a five-year, $486,000 research grant from the National Science Foundation (NSF), Dr. Steven Quiring, associate professor at Texas A&M, is working to develop a system that will be able to predict the occurrence and severity of drought. Unlike earthquakes, hurricanes and tornadoes, drought unfolds at an almost imperceptible pace with beginning and ending times that are difficult to determine, wrote Dr. Todd Votteler of the Guadalupe-Blanco River Authority in a 2000 article for Texas Parks and Wildlife’s magazine. “Drought prediction is essentially using something in the climate system known as memory, and the primary source of memory is the oceans,” Quiring said. Oceans are important in the hydrologic cycle because of their massive ability to store heat content. Therefore, changes in surface temperatures and evaporation rates have global implications in regard to climate and precipitation. Two well-known examples of this phenomenon are El Niño and La Niña, he said. “However, the oceans are fairly well understood but not perfect in their ability to predict drought,” Quiring said. 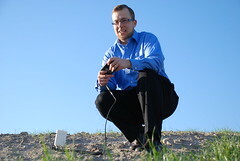 His research focuses on soil moisture, a secondary driver of climate variability that also serves as a source of memory. In addition, Quiring will study how drought predictions can vary over time and space. Quiring explained that 2011 is a great example of how land-atmosphere changes have significant impact in initiating and exacerbating drought conditions. But could climatologists predict drought like meteorologists forecast the weather? Quiring explained that measurements for soil moisture are sparse when compared to measurements and records maintained for temperature and precipitation. “We don’t really have a good source of direct observations for soil moisture and how soil moisture has varied in the past,” he said. Through this project he hopes to identify soil moisture monitoring stations across the Great Plains and archive observation results in one central location. With combined data available from nearly 1,500 regional observation stations, Quiring and his team of graduate and undergraduate students will study each location’s soil types and soil moisture and their influence on land-atmosphere changes. Even if the project only produces a standardized, homogenized database, that will be a huge step forward, Quiring said, because that has never been done before. In addition, locations currently without any observations can be identified and tagged as high-priority areas for future data collection. “Understanding current conditions is a key factor for making predictions, whether it’s weather predictions or seasonal predictions,” Quiring said. “We are trying to forecast the probability of a drought to occur.” Soil moisture observation data will help improve understanding of land-atmosphere changes and their influence on drought, he added. How much influence do oceans have? How much influence do land-atmosphere interactions have? Why does soil moisture seem to be more important in some years? “We want to improve predictions so they are accurate enough for decision makers to be confident in decisions that put their financial future on the line,” he said, adding that an accurate prediction system influences all natural resources sectors, from utility companies to farmers. Agricultural losses have made the 2011 drought the most costly on record, according to the Texas AgriLife Extension Service. Quiring believes that a drought prediction system is a needed decision-making tool for farmers and ranchers to use when deciding whether or not to let a field remain fallow until conditions are favorable for planting. “Advanced warning of an impending drought also would allow for more water to be stored in reservoirs and for water use to decrease slowly to save up for drought,” he said. Dr. Steven Quiring will work with graduate and undergraduate students to develop a drought prediction system over the next five years. Photo by Karen Riedel, College of Geosciences, Texas A&M University. Editor’s note: We’ll continue to follow Quiring and his team to provide up-to-date information on the five-year project.